Dear Readers, I must confess that I rather like walking in the rain. 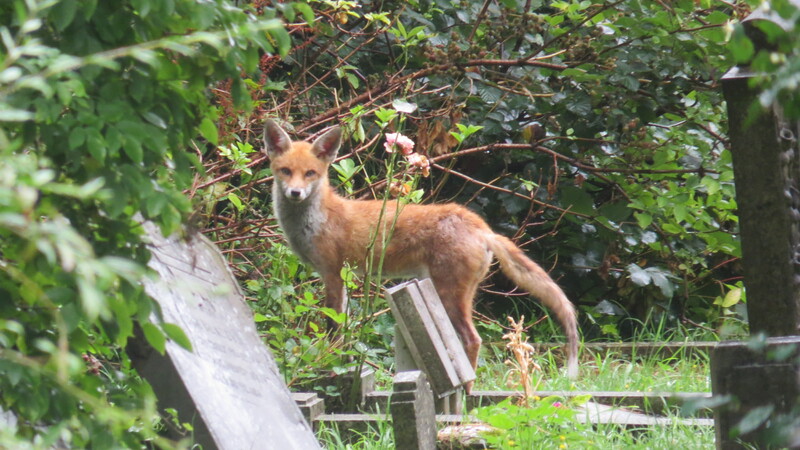 The cemetery is always quiet: people still need to be buried or cremated, but there are fewer dog walkers and youngsters on mopeds, and the folk that are there are hurrying through. 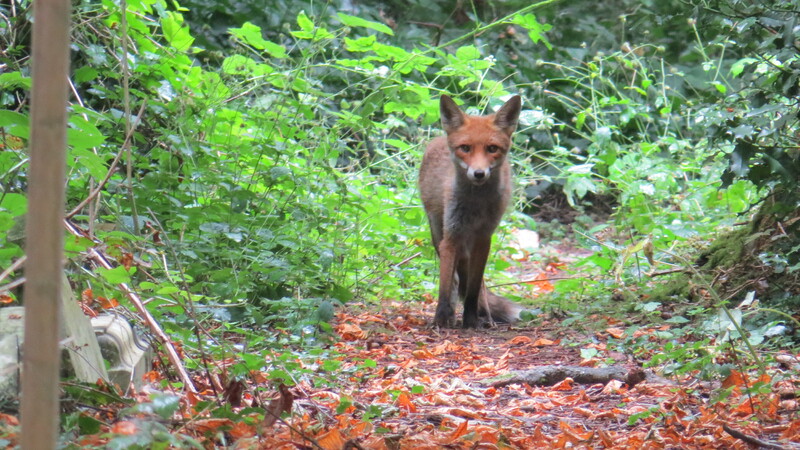 But the biggest advantage is that the foxes are much more relaxed: they almost seem to know that people don’t like getting wet, and so they sit around, watching us rushing past with our umbrellas and our sou’westers, sniffing the air to see if we’ve brought any food. 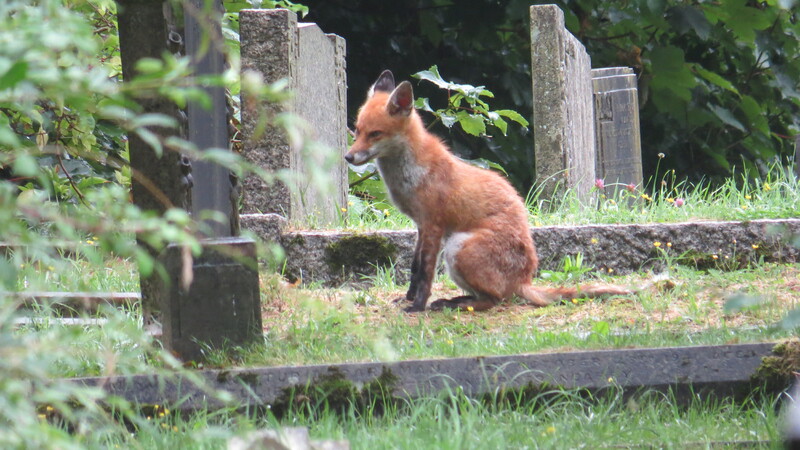 The adult foxes that I have grown used to seeing seem to have disappeared at the moment: whether they’ve found another source of food, or are simply feeding at a different time, I don’t know. But I have seen two new foxes, both tall and skinny, as if they’re wearing stilts. I know that the resident vixen was lactating, and so I’m thinking that these animals are probably two of her cubs. 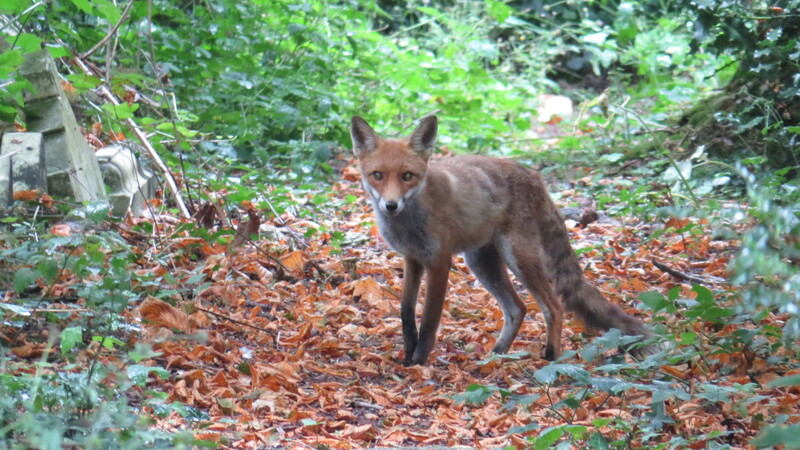 I am almost sure that the one in the photograph above is a little vixen – she seems shyer than the cub in the earlier photographs. She looks skinny, but in perfect health – her tail is fine and bushy, her eyes are clear, and she still has the slightly fuzzy coat of the cub. I love the way that her coat blends with the fallen horse-chestnut leaves here. 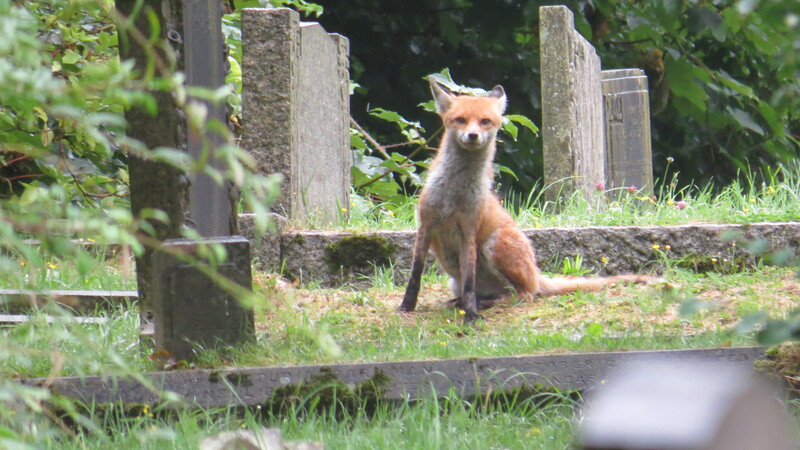 She watches me from a safe distance, and if I try to get closer, she disappears into the gravestones and brambles at the edge of the path. The cub that I think is her brother is a much scruffier little animal. 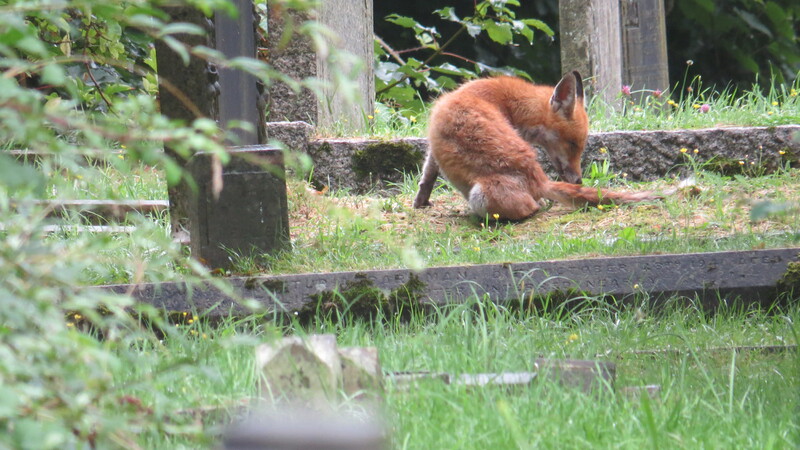 I spotted him today sitting out in the open in the rain, having a good old scratch. This, of course, is not a good sign. Male cub having a good old gnaw at his tail. Time for the mange medication…. He seems, on the face of it, to be a bit smaller and skinnier, and generally mankier than his sibling. He spent a long time biting at himself, and I will be medicating his sandwiches as from tomorrow. But what a character he is! It’s always interesting to see caution and curiosity play out in the expression of an animal. This little guy (for indeed, he is a guy) really didn’t want to go. Maybe he’d never seen a camera-wielding middle-aged woman standing in the rain before. And then, as if to make sure, he had a good old sniff of the air. Well, I didn’t pass muster, because after one inhalation he disappeared. I don’t suppose it will be the last time that I see him, though. 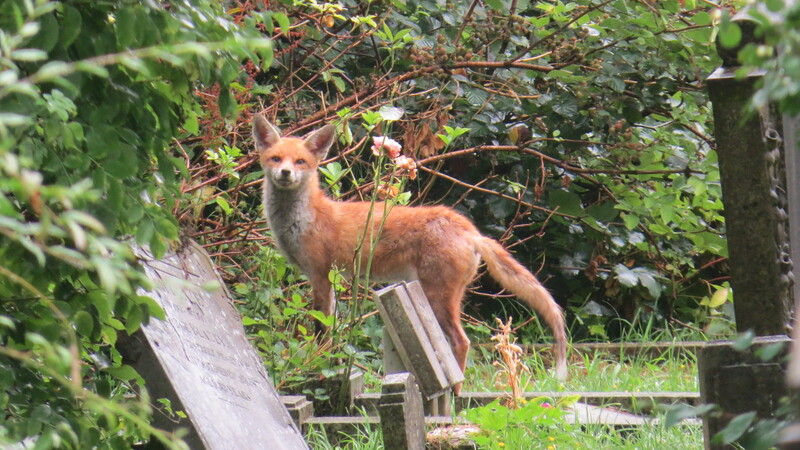 Things are never dull in the cemetery, even on a rainy day. All photos copyright Vivienne Palmer. Free to use and share non-commercially, but please attribute to me, and link back to the blog, thank you! This entry was posted in London Mammals, London Places on August 6, 2016 by Bug Woman. Walking in the rain is a real pleasure but I don’t quite know why. Perhaps it is that looking at rain from a window makes it look worse? Delightful pictures of the youngsters and I am so happy to know that you will be dispensing homeopathic medication to the poorly one. By the way, Nelsons seem to have stopped making their ‘Combination’ pills now so, may I ask where you get the medication that you use? Hi Toffeeapple, I get the homeopathic drops from Denes (arsenicum album), but the National Fox Welfare Society send them out for free if you put in a request on their website. That is very useful to know, thank you very much.